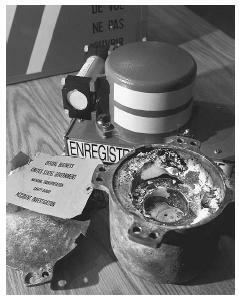 The charred casing of the flight data recorder recovered from the crash of American Airlines flight 587 is displayed at the National Transportation Safety Board in 2001, along with a normal, undamaged flight recorder (at rear). would struggle to figure out what happened immediately preceding the accident but often fail to come to any definite conclusions regarding the cause of the crash. In June 1960, a Fokker F27 plane crashed while landing in Queensland, Australia, killing 29 people. Despite intensive investigations, the underlying cause for the accident was never determined. The mystery prompted the Australia board of inquiry to recommend that all airplanes be fitted with a flight data recorder (FDR) that would detail the flight crew's conversation. Efforts to make the FDR a mandatory part of civil aircraft date back to the early 1940s. The idea, however, was wrought with one enormous technological challenge. Design specifications required that the unit survive the forces of an aircraft crash, as well as any resulting fire exposure. In 1953, at a time when flight engineers were attempting to understand why a number of airliners had inexplicably crashed, Australian aviation scientist David Warren of the Aeronautical Research Laboratories in Melbourne invented a fully automatic "Flight Memory Unit." His prototype could record cockpit noise and instrument readings and remain in tact following a crash or fire. Much to Warren's surprise, Australian aviation experts and pilots originally rejected the idea, on the premise of privacy issues. Warren took the concept to the United Kingdom, where it was well received by aviation officials. By 1957, the FDR was in production. Australia was among the first countries to require the device on commercial aircraft. The phrase "black box," however, is a misnomer. Flight data recorders are actually painted a bright red or orange for easier location after a crash. The FDR is encased in heavy steel and surrounded by multiple layers of insulation to provide protection against a crash, fire, and extreme climatic conditions. The device records actual flight conditions, including altitude, airspeed, heading, vertical acceleration and aircraft pitch. A second device, the cockpit voice recorder (CVR), keeps tabs on cockpit conversations and engine noise. Both are installed in the rear of the aircraft. In the 1970s, FDR technology was combined with a flight-data acquisition unit (FDAU), located at the front of the aircraft. The unit acts as the relay for the entire data-recording process. Sensors run from various areas on the plane to the FDAU, which in turn sends the information to the FDR. In the early days, data were embossed onto a type of magnetic foil known as Incanol Steel. The foil proved to be destructible and FDR manufacturers began using a more reliable form of magnetic tape. Electromagnetic technology remained the data-recording medium of choice until the late 1990s, when solid-state electronics began to show promise. Solid-state recorders rely on stacked arrays of non-moveable memory chips. The technology is considered more reliable than magnetic tape, as the lack of moving parts provides a reduced chance of breakage during a crash. Solid-state recorders also track a much greater number of parameters; 700 are tracked compared to the magnetic tape parameter recording potential of 100. Faster data flow allows the solid-state devices to record up to 25 hours of flight data. In 1997, the United States Federal Aviation Administration (FAA) issued a requirement that all aircraft manufactured after August 19, 2002 record at least 88 parameters. The action came in the wake of two B-737 airplane crashes in which insufficient data was available for determining the cause of the accidents. In addition to the five above-mentioned parameters recorded by the earliest data recorders, today's devices also track time, control-column position, rudder-pedal position, control-wheel position, horizontal stabilizer, and fuel flow. Since its inception, the FDR has played a vital role in establishing the probable cause of a crash or other unusual occurrences and has allowed safety regulators to implement corrective actions. The value of flight data recorders was clearly evident in the investigation of the ATR-72 accident in Roselawn, Indiana in October 1994. The FDR captured information on 115 parameters. Analysis of the data revealed a telltale, rapid wing movement that prompted the National Transportation and Safety Board to immediately issue urgent safety recommendations to improve flying in icing conditions. "The Black Box: An Australian Contribution to Air Safety," March 21, 2002 < http://www.dsto.defence.gov.au/corporate/history/jubilee/blackbox.html >(December 08,2002). "Black Boxes," February 22, 2002 < http://www.atsb.gov.au/aviation/editorial/flrec/index.cfm >(December 08,2002). "A History of the Black Box," < http://www.millennium.scps.k12.fl.us/istfbbhistory.html >(December 08, 2002). "How Things Work: Black Boxes," < http://www.howstuffworks.com/black-box1.htm >(December 08,2002). L-3 Communications Corp., "Aviation Recorders," 2002, < http://www.l-3ar.com/html/history.html > (December 11,2002). National Transportation and Safety Board, " Data Collection and Improved Technologies," May 20, 1998 < http://www.ntsb.gov/speeches/s980520.htm > (December 08,2002).